01 07 William Guyer, instructor of choral music in the Watertown public schools, announced that he is now conducting the Guyer Music store at 109 North Third Street, in the same building which for many years housed the Hawes Appliance Co.
Mr. Guyer recently purchased the music department of the Hawes' concern and will operate it from now on. At present he has a large stock of records and also has some radios and television. He expects to enlarge his stock as soon as he can secure additional supplies and plans a grand opening at a later date when his stock is complete. He will add musical instruments, etc. William J. Guyer, 57, 808 South Eighth Street, prominent resident and former teacher in the Watertown School System, died Sunday afternoon at Watertown Memorial Hospital following a long illness. The funeral will be held Wednesday at 2 p.m. at the First Congregational United Church of Christ. The Rev. Robert Tully will officiate. Interment will be in Oak Hill Cemetery. Friends may pay their respects at the Schmutzler Funeral Home from 3 to 9 p.m. Tuesday and on Wednesday up to 10 a.m., after which the body will be taken to the church to lie in state. If desired memorials may be sent to the organ fund of the First Congregational United Church of Christ or the American Cancer Society. Guyer was born in Ironwood, Mich., Nov.29,1916, the son of Mr. and Mrs. Louis Guyer. His marriage to the former Virginia Dale Johnson took place Aug. 9, 1941, in Duluth, Minn. He attended Ironwood Public Schools and graduated from Lawrence University Conservatory of Music in Appleton in 1939. He received his master music degree from Northwestern University, Evanston, Ill., in 1946. 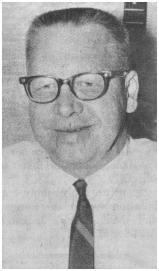 He taught public school music in Sturgeon Bay from 1939 to 1942. He came to Watertown in 1942 as director of vocal music. He served in the Armed Forces in the Pacific during World War II from 1943 to 1946. After his discharge, he returned to Watertown and was a vocal supervisor in Watertown schools from 1946 to 1950. In 1950 he established the Guyer Music Store in Watertown, owning and operating the business for 13 years. He later became associated with the Warren-Schey House of Music, continuing his association until the present time. He was a member of the First Congregational United Church of Christ. He was a director of the senior choir of the church for 20 years and served as moderator of the church for one year. He directed the combined choirs of all the churches in Watertown for the city’s centennial celebration 20 years ago. He was a member of Watertown Lodge No. 49, F. and A.M., American Legion Post 189 and the Lions Club. He was a past president of the Lions and was also a past president of Webster School P.T.A. He served nine years on the board of Watertown Memorial Hospital. He was one of the organizers of the Community Concert Association and a past president. He had also served as chairman of the Community Chest drive. He is survived by his wife; one son, William Guyer Jr. Sterling Heights, Mich.; one daughter, Mrs. Scott (Joan Marie) Gregory, Chandler, Ariz.; one granddaughter and one grandson. He was preceded in death by an infant son, his parents and one brother. In the passing of Bill Guyer, Watertown has lost one of its solid and one of its highly respected residents. In his quiet and unassuming way he contributed much to the betterment of our community. He did a great deal for the music departments of our public schools. He was highly talented. After he established a music store here, he became involved more extensively in community affairs and made substantial contributions in many areas. His views always were respected and well received. Watertown is better because we were privileged to have Bill Guyer in our town.